"They mooched on to the far flung shores of Lake Amadeus-that weird lake of salt". Ion Idriess, Lasseter's Last Ride. 96. Lake Amadeus is the Northern Territory's largest lake, located some 200 miles W.S.W. of Alice Springs, the lake is a salina, approx 70 miles long and about 8 miles at its widest, aligned along a NW/SE axis and directly across Lasseter's intended route from Illbilla to Mount Olga. Lasseter's maps at pages 47 and 48 of his Diary indicate that he and Paul Johns crossed the lake at a point directly to the north of Mount Olga, a notable feat considering the lake had defeated some of Australia's more redoubtable explorers. In late October 1872 Ernest Giles made several attempts at crossing the lake to Mount Olga, all failed and some were near disastrous. One foray, perhaps near where Lasseter and Johns made their apparently successful crossing, nearly cost Giles his expedition when his horses broke through the salt crust and were immediately, floundering about in the bottomless bed of this infernal lake ~ We were powerless to help them, for we could not get near owing to the bog, and we sank up over our knees, where the crust was broken, in hot salt mud. All I could do was to crack my whip to prevent the horses from ceasing to exert themselves, and although it was but a few moments that they were in this danger, to me it seemed an eternity. They staggered at last out of the quagmire, heads, backs, saddles, everything covered with blue mud, their mouths were filled with salt mud also, and they were completely exhausted when they reached firm ground". Lake Amadeus defeated Giles on his first attempt at crossing to the west coast of the continent. The following year William Christie Gosse had similar difficulties, crossing Giles tracks several times, searching for a way south, but whereas Giles followed the lake to the N.W. Gosse travelled S.E. and crossed the lake at a narrow neck, at "latitude 24° 50', longitude 131° 30'," and continued south and west to happen upon the most remarkable natural feature he had ever seen, "being one solid rock (fine conglomerate) two miles long, one mile wide, and 1100 feet high, a spring coming from its centre. I named it Ayers Rock." In August 1886, Henry Tietkins, Giles Second in Command on his 1873 and 1875 expeditions, reminded members of the South Australian branch of the Royal Geographical Society, that very little was known about Lake Amadeus, "on our present maps we see a leg of mutton shaped figure, bounded by dotted lines, but the real extent of this interesting feature is unknown to us", no doubt with an eye to future employment Tietkins suggested that the Society, the Government and the citizens of South Australia had a duty to rectify this oversight. On the 22nd of July 1889, as leader of The Central Australian Exploring and Prospecting Association Expedition, he reported from Erldunda that his expedition was safe and well, but had found no gold or grazing lands and "Mount Unapproachable in Long's Range marks the western extremity of Lake Amadeus". The Horn Expedition crossed the eastern end of the lake in June 1894, and noted that the surface of the lake was found to be tolerably firm, the horses only sinking to the depth of a few inches". 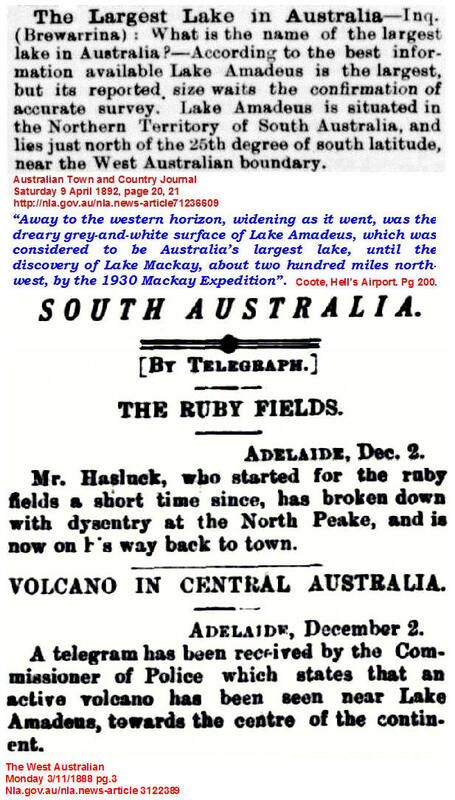 In October 1902, W. R. Murray, the surveyor on R. T. Maurice's expedition to the north coast, reported on the journey and had little to say about Lake Amadeus, "we crossed Lake Amadeus at its western end, after having made several unsuccessful attempts to get over it at its broader parts"
Yet it seems Lasseter was unaware of what was now widely known, that Lake Amadeus was a well defined hazard that should be avoided. A month before arriving in Central Australia, Lasseter wrote to Mr. W. Johansen, Boulder City in Western Australia, and from the tenor of Johansen's reply it seems that Lasseter was concerned about warlike Aboriginals and Lake Amadeus in flood. Johansen was no help, having no experience with Aboriginal war parties a thousand strong and he had never seen Lake Amadeus in flood, although he assumed it must expand appreciably in the rainy season from catchments in the mountain ranges to the north and south of the lake. Lasseter crossed the lake without the benefit of Johansen's doubtful knowledge, he wrote the day before Lasseter left Alice Springs. Idriess wrote a stirring account of the crossing from scant information, contrary to John Baileys assertion, Idriess interviewed all members of the first CAGE Expedition when they returned to Sydney, "in dribs and drabs", and he would have found kindred spirits in Blakeley and Sutherland, but they could tell him nothing definite, only that Lasseter was travelling to the Petermanns and beyond via an uncertain route. Idriess would have learnt something of Lasseter's movements when The Daily Guardian, Sydney, printed a lengthy interview with Mrs. Irene Lasseter on 21/1/31, apparently based on Lasseter's letter written from Illbilla at the end of October 1930, he mentions that "Lake Amadeus is like a big sheet of white salt. I think it would make a wonderful speedway". This is repeated in Lasseter's Last Ride as, "Lasseter described its shores as a wonderful speedway", Idriess qualifies this bit of nonsense with, "Its centre, however, was boggy". He adds Aboriginal guides and a camel calf to Lasseter's party and has them leaving from tree lined shores, the camels were difficult, breaking through the salt crust several times, "they coaxed and belted the brutes across fifteen hazardous miles", to the southern shore, then on to Mount Olga. Paul Johns was unusually reticent about his travels with Lasseter, until his statement to Ernestine Hill in October 1932, (the statement, titled, 'About Lasseter' was not published until 1968) where he gave a prosaic account of crossing the lake, he and Lasseter travelled directly south from Putardi to Mount Olga, it was a twelve and a half day slog to Lake Amadeus, about half way across the lake the camels bogged, when the exhausted beasts had been dug out they returned to the northern shore and next day tried further down the lake, that is to the south east, and were successful, continuing on to Mount Olga. Johns then wrote two full length articles, 'Last Days with Lasseter', for the Melbourne Sun on 9/12/34, and, 'Lasseter's Reef', for the Sydney Mail on 7/08/35, the crossing of the lake was now a dramatic event, worthy of Idriess. The camels bog in the usual place, half way across the lake, and were sinking, "Frantically unslinging their loadings, straining at trappings and nose-lines, shouting and cursing, we finally succeeded in freeing the animals from the grasp of the mire, and chased them from this dangerous spot." back to the northern shore of the lake, and after recovering the camels and loadings, "travelled down the lake and found a safer place to cross; but even so the going was slow and difficult. They made the fifty miles to Ayers Rock on two gallons of water. Blakeley had no useful knowledge about Lake Amadeus, except it was part of that enormous geological feature, 'The Big Breakaway', when he viewed the scene from Lasseter's Lookout in early September 1930 he described a sunken valley three miles wide and nearly 200 feet deep he added, No doubt Lake Macdonald was part of this gutter. It would be about a hundred miles north-west of us. Lake Amadeus would be nearly twice that distance south-east on the same fault", thus placing his expedition and Lasseter's Lookout somewhere in the northern parts of Lake Mackay. Coote had more direct experience with the lake on 28/10/1930 when he flew the Golden Quest II over an eastern extremity on his way to Ayers Rock, the hot rising air from the lake caused a few anxious moments, "The 'plane was being thrown everywhere", and he found nothing inspiring in the scene, "It looked a terrible place ~ The whole place seemed dead". Lasseter had very little to say about Lake Amadeus in his diary, he shows where he and Johns were bogged on a northern arm of the lake and after freeing themselves continue across the lake south to Mount Olga. He mentions in passing that the rabbits were breeding up and there was plenty of cattle feed south of the lake but not a word about crossing the uncrossable lake, "a task which no white men have ever accomplished before or since. ", according to Paul Johns. Lasseter's maps of the journey are 'odd' with south to the top of the page, giving the maps a sense of having been drawn backwards, Lasseter's maps end at Ayers Rock. Ernest Giles, Australia Twice Traversed, Vol 1, pgs. 96-100. Journal of the Horn Scientific Exploring Expedition 1894, pg, 31. Fred Blakeley, Dream Millions, pg. 136,137. Errol Coote, Hell's Airport, pgs.136,199,200. About Lasseter, Paul Johns Statement to Ernestine Hill, Scrivener Press, 1968. The Sun (Melb) 09/12/1934, pg. 19. The Sydney Mail, 07/08/1935, pgs. 10,11. Ion Idriess, Lasseter's Last Ride, pgs, 96,97. Lasseter's Diary, pgs, 47,48,87.